At Peter Limmer and Sons, we feel confident that we can provide you with the finest possible footwear for your hiking needs. 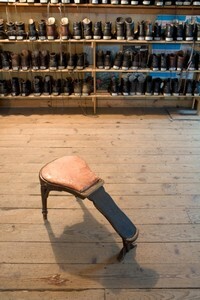 At Peter Limmer and Sons, we have been told we make the best boots in the world. We don't like to boast, so we let our customers say it for us. We have a library of testimonials going back to the beginning when Peter Limmer Sr. started making his traditional Tyrolean Walking shoes as well as his Patented ski boots . Even before that, in the foothills of the Bavarian Alps, Peter Sr's father made footwear in a small shop in the town of Peterskirchen Germany. 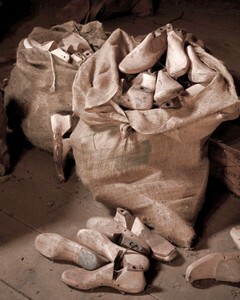 Peter Sr obtained his Master Shoe Makers certificate from the Shoemaker's Guild on August 25th, 1921. He moved to the U.S. in 1925 and set up shop in Jamaca Plain area around Boston and became popular with is shoes. His 2 sons, Peter Jr and Francis learned the trade there. In 1950, Peter Sr moved his family from the Boston area up to the White Mountains of New Hampshire because it reminded him of his home in Bavaria. Since the days of the Limmer Ski boots which were made of leather, the plastic boots have taken over that business, so we now offer only the Limmer Hiking boot line. From here, the family owned business has shod feet of the famous and not so famous wilderness trampers from New England to Tasmania. At Peter Limmer and Sons, we feel confident that we can provide you with the finest possible footwear for your hiking needs. We offer both our hand made stock models as well as our hand made Limmer Customs . Some people ask 'why go with the Custom Boot?' There are 2 main types of people that opt for the Customs. First is the person with a fit challenge in the form of odd shaped feet or feet of greatly different sizes. The second is the person that just wants the ultimate in all of his or her hiking and backpacking gear. 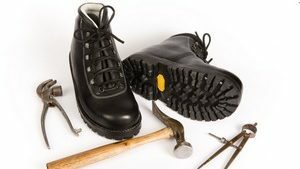 Our boots are a sound investment whether stock or Custom as they offer extreme durability and reliability. It is not unusual to have boots in our repair department that are 50+ years old and still going strong. With over 30 years of experience in making boots, Peter S. Limmer, grandson of Peter Sr, will put the same painstaking care and effort in making you the best pair of boots you will ever wear. Although we have sustained somewhat of a backlog for the past 40 years or so, most people say the wait is well worth it. Our goal has always been to deliver a quality product and that principle has held precedence over big profits for the duration of our business. Please, browse the website to view our offerings and feel free to contact us if you have any questions. Dear Limmers:Just a note to say how pleased I am with your (my) custom made hiking boots from your shop. The fit is perfect and they have put up well with everything I've put them through (and the trails have dished out) so far.Your recommended break-in term of 80+/- hours I found to be a little light - it actually took about double that time for the boots and my feet and my socks/livers to begin to perform as individual, homogeneous units. But when that time finally evolved, the result was like nothing I've ever used on the trails in any form of equipment - the best. Moleskin is a thing of the past, even in the roughest country with a large, heavy pack for days at a time.They now have only 300+/- miles on them, but they've been from Pennsylvania to Maine, and many places in between.I enclosed a photo of my boots for your wall or fame taken at the old log dam at Duck Hole in the Cold River Country of the High Peaks Wilderness in the Adirondacks of New York. I have just concluded a 40-mile backpack of the area to visit the spirit of Noah John Rondeau, the Last Adirondack Hermin (1883-1967). He left the wilderness forever in 1950, but his spirit remains - some folks say he's up there, still.Thanks you very much for building the last pair of boots I'll ever buy.Sincerely George N.
To Limmers:On our many excursions to the White Mountains my husband and I had the opportunity to stop by the shop and eventually purchased our very own Limmers. On the bulletin board were displayed pictures of the lofty heights, which Limmers attained.I have also enclosed a picture. My husband died Feb. 9th of this year. He requested that his Limmers be buried with him. I wanted to share this with you because not only can Limmers carry the hiker to far-off exotic summits, but also the opportunities and memories they provide can sustain and carry a person through the trails and tribulations of everyday existence. Even when my husband was in the later stages of brain cancer, The memories those years of hiking in his Limmers brought great joy and comfort.I hope you interpret this letter not as a morbid example of the finiteness of life but as an example of the journey of life for my husband's Limmers became the foundation for a life well lived.Sincerely, Maureen H.
Hello, On my way to New Hampshire the Canadian immigration officer asked me where I was going. "To Montreal." "Why are you going to Montreal?" "Actually I'm just going through Montreal to get the New Hampshire. I'll go around Montreal if I can figure how to do that." "And why are you going to New Hampshire?" "To get some hiking boots." Incredulous he asked "You're going all the way to New Hampshire to get some hiking boots? "So I told him the whole story. 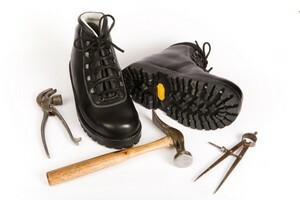 Limmer boots were used by the members of the first successful U.S. assault on Everest. I had some made in 1967, but they don't fit anymore. They still had the drawings of my feet on file from 1967, but they needed new measurements, since my feet had changed, so was really going to New Hampshire to get me feet measured for some boots...A subtle smile came across his face. "Have a nice trip," he said, without asking to see identification. Now, its' not very often I see an immigration officer smile, so I asked, "Have I made your day? "Yes," he said, "I like stories like that. "On my return the U.S. immigration officer asked for the purpose of my trip. "I went to New Hampshire to get my feet measured for some hiking boots." A faint smile, nearly undetectable, crinkled around his eyes. "Have a nice evening," he said. Didn't ask for identification.These guys must talk to each other.I enjoyed visiting and look forward to my boots and visiting again with Tammy.Thanks, Rudy L.
Dear Mr. Limmer and staffI have just returned from a week of hiking in the Smokey Mountains with a vastly different experience and much greater success than my previous Spring Break foray onto the Appalachian Trail, and I owe it all to my Limmer custom boots.Two years ago, while still on the waiting list for custom boots, I intended to go from Harper's Ferry to Boiling Springs in a week's time, hiking in my Limmer Lightweights, (in which I had done all the 4000 footers in New Hampshire with reasonably good success). Unfortunately, I had to prematurely terminate my trek to Boiling Springs after four days, as I was crippled by 16 blisters and two broken toenails.This past week after breaking in my custom boots over the past year, I waltzed my way from Hot Springs to Fontana through the entire length of the Smokey's with nary a blister. You can imagine the improvement to my attitude.Next up will be a week on the Continental Divide Trail sometime this summer and then hopefully three weeks on the John Muir Trail next summer-cushioned every step of the way in my custom Limmers.Thank you for building me a pair of boots that will accommodate my stubby high volume 4E feet. It was worth the wait.Sincerely Karst H.
See what we are up to by following along on social media.